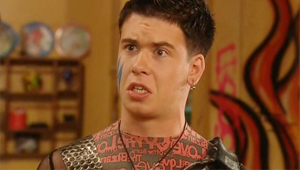 Darryl is first seen in series five episode eight, and is recruited by Mega as Zoot's look-alike. On Tribeworld, Darryl is described as friendly, very human, and quite vulnerable. He appears vain at times, but this can probably be attributed to a lack of self-confidence. He is easily swayed by compliments and is deeply hurt by rejection. He longs to be popular and successful, but does not really have a clue about how he will achieve this. Darryl is easily impressed and led, particularly by seemingly strong characters such as Lex, who to an extent, preys on Darryl's naivety. Darryl was working in the Casino when he is found by Mega, who then uses him as a Zoot impersonator, thanks to his striking resemblance to Zoot. After Mega succeeds in scaring most of the city into submission, he shoots Darryl and leaves him for dead. Darryl is found and taken care of by Slade, who leads him out of the city to Liberty. There, Darryl becomes part of the resistance and helps Lex run his illegal virtual casino in Ruby's Saloon. He takes part in the liberation of the city and ends up living at the mall and joining the Mall Rats. At the end of the series, Darryl flees the city on a boat with the other Mall Rats, after a new virus is released. When we first meet Darryl he is in a copycat Zoot costume including hair and makeup. Darryl's first non-Zoot costume consists of a purple shirt, with a flora collar, cuffs and green start buttons. A black Lycra wide shoulder vest, with the front cut out, covered by a sheer multi-colour fabric. A maroon drawstring is threaded through this and tied at the back. His jeans are bootlegged and a stretch fit, they are denim and brown corduroy. A snakeskin belt is used to hold them up. Darryl tops this outfit off with a beaded bracelet and brown leather shoes. His hair is floppy, with a large brown and blue tribal marking over his right eye. Darryl's final outfit is much more punk than his original non-Zoot outfit. The top is a tight fitting Lycra with writing on it. Darryl wears it inside out so the writing appears black on a red background, the writing says, 'the love of the bizarre' it has a crew neck with black mesh sleeves. Over the top of this a one armed shirt is worn, it is green in colour with a zip pattern printed on it. Over the shirts a black and silver harness is worn. It has two shoulder straps and one waist strap that all meet at the front and attach to a large silver ring. The harness is made of textured black vinyl and a layer of silver plastic with many holes in it. This gives is a metallic effect. It is done up at the back with eyelets and drawstring. This is paired with a pair of red tartan trousers which are tapered at the bottom to tuck into his silver snakeskin Doc Martins. The left pocket sits near the waist band which the right one is halfway down the thigh. Both pockets are very large, decorated with black strapping with d-rings at the ends. Under the left pocket the black strapping continues running down the side of the leg to the bottom of the trousers. The fly is done up with large black boot laces that are criss crossed through metal eyelets. On the back of the pants there are two more pockets on the bum that match the two at the front. Around his neck Darryl wears a silver tooth necklace with a red flame pattern on it. This is teamed with a shorter Mohawk hair style with lighter tips paired with a blue marking on his right cheek.